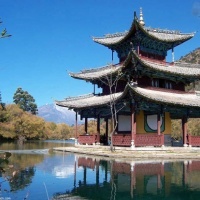 The Black Dragon Pool Park is also known as the Jade Spring Park, which is situated on the northern edge of Lijiang Old Town. There is a Black Dragon Pool in the park, hence the name. The pool covers an area of 40 hectares. It is home to bird, water-life and plants. 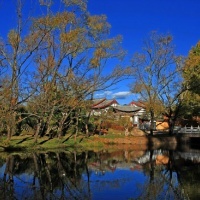 Surrounding the pool, within the park's landscape, are ancient monuments such as the Longshen Temple (Dragon God Temple), the Deyue Pavilion, the Suocui Bridge and the Hanyue Stage. 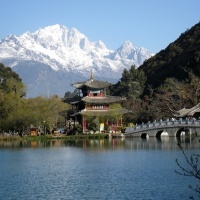 In the park you can make a long distance view of the Jade Dragon Snow Mountain. Apart from strolling around the pool, you can also visit the Dongba Research Institute, which is part of a renovated complex on the hillside. There is a small museum with Dongba scrolls and artifacts on display. The park is open from 8 am to 5pm. It will take you 15 minutes to get there if you walk from the Old Town of Lijiang or alternatively by taxi in Xin Dajie (in the town), you need pay about RMB 6 yuan. 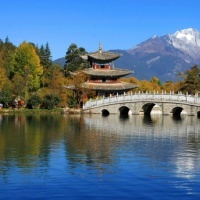 Design and incorporate the Black Dragon Pool Park into your Yunnan tour here!